I’ve been wanting to get back into yoga for a long time now. However, my yoga mat has been sitting in the backseat of my car never being used for close to a year. Poor little thing. Finally, yesterday, I decided to let it’s pretty pinkness back into my life…in the middle of my living room nevertheless. So far I’ve only stepped on it a couple of times, only for a few minutes each time…but when I do I choose a pose that I love (i.e. triangle pose!) and it feels so darn good to be doing it. However, since I’m in the pose while watching the blaring television at the same time, I’m not sure you can actually call it yoga. I’m definitely not a yoga guru, although I pretty much wish I was. Let’s go ahead and add become a certified yoga instructor to the bucket list. I’ve only ever taken a few beginner yoga classes, but I’ve always loved the way yoga makes me feel. The problem is that there are no yoga classes in town (that I am aware of) and I just feel silly doing yoga by myself in my home. Sure I know a few poses and feel great about my technique, but I have no ability to come up with sequences, fluidity, or anything that makes sense. Warrior 1, okay good. Um, next? How about pigeon? Better add some down dog in there. There are a few things that I do know about yoga, though. Yoga helped me become a runner. I was doing yoga consistently when I was training for my first half marathon. Yoga helped me learn how to control my breathing which helped prepare me for the long distance. Yoga is a good stretch. Obviously. And stretching helps prevent injury. Lastly, yoga is good for the mind and for the heart. It’s time to go hit up my studio! P.S. Does anyone have any at-home yoga advice?! Please help!!! I had no idea the they offered FREE classes! Unfortunately I live at least an hour from any store, but I’ll still look it up for when I go to town! Thanks! I second the Lululemon store comment above but there are tons of great videos for at home yoga. I wrote a post with tons of suggestions. My favorites are yoga download, my yoga online, you tube and just good old DVDs! Netflix has some videos for free too! If you do it a few times to a video you can at least get an idea of how to create some good flows! Hope this helps! And happy yoga to you! One thing that I find helpful at home is really relaxing meditation music – you could search ‘traditional native flute’ or ‘reiki music’ on itunes. Also I use the app ‘Yoga in Bed’ for when I otherwise can’t bring myself to get down on my mat. It’s very simple but has some good stretches. I use Youtube to learn sequences; I’m currently working on ‘Advanced Sun Salutation’ – there are so many videos that are helpful that I wont link to any one in particular. I’m not a Yoga expert either, but I hope this helps! I can’t believe I never thought of using YouTube! Perfect idea!!! Thanks! I am NEVER motivated to do my at-home yoga DVDs but too scared to GO to a class because I am SO inflexible, it’s ridiculous! 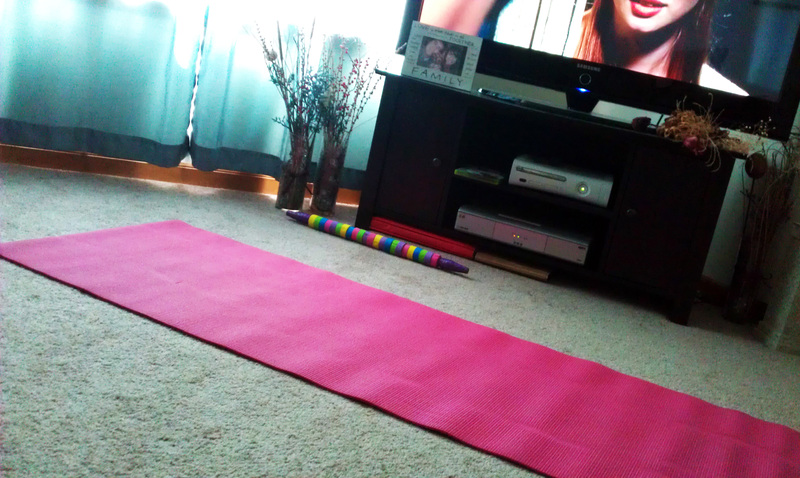 I need to be one with my yoga mat more too. I’m with you on that one!! You can get a 2 week free trial to My Yoga Online. You don’t need a credit card to sign up like most of the other sites. Go to their facebook page and click Free Yoga – http://www.facebook.com/myyogaonline You can view some sample videos too. They have videos from 5 minutes to over an hour so there’s a good mix for all levels and time commitments.